Beyond Einstein, by Michio Kaku and Jennifer Trainer, begins by peeking the interest of the reader in stating that a "revolution is rocking the foundations of modern physics". Paper Masters can help explain what Kaku and Trainer mean by revolution in a research paper on Beyond Einstein. According to Kaku and Trainer, the revolution is the concept of superstrings. Superstring theory is defined in the higher dimensions of hyperspace, a space consisting of 10 dimensions for clockwise vibrating strings, and 26 dimensions for counterclockwise vibrating strings. The idea of explaining physics in higher dimensions is not a recent discovery, as Einstein pictured time as the concept of a fourth dimension. The first paradigm shift away from Newtonian physics occurred when Albert Einstein came up with his famous theory of relativity. Before Einstein's Theory of relativity, most physics was still Newtonian in nature. Physical phenomenon was explained by interaction of force with respect to a constant flow of time. When Einstein's revolutionary 1905 paper was published, it was largely ignored. In Fact, he submitted the paper in order to secure a teaching position at University or Bern, and the classical Newtonian physicist rejected the paper in much the same way Galileo was rejected with his finding with his telescope. Only years later, when the experimental evidence pointed out the correctness of Einstein's Theory, did the scientific community realize that the idea was a stroke of genius. Hyperspace theory has been mathematically proven conclusively and hyperspace theory, incorporated with superstring theory, is considered mathematically sound. Therefore, the only problem that arises in the superstring theory is the impracticality of securing experimental proof. The domain of science which superstring theory attempts to explain encompasses both exotic macroscopic objects and microscopic oddities. Descartes and Material Substance - I have no trouble imagining something being infinitely divisible and yet still real, something that is perhaps reinforced by discoveries of modern physics. Carl Jung's Theory of Synchronicity - Synchronicity is a difficult theory that was shaped by influences from several different schools of thought. Order a research paper on Carl Jung from Paper Masters. Dreaming from a Biological Perspective - A researcher from Albert Einstein College of Medicine suggests that dreams are the body's natural healing system. Max Planck -Physicists throughout the 20th century accepted Planck's theory – as did the great physicist Albert Einstein. 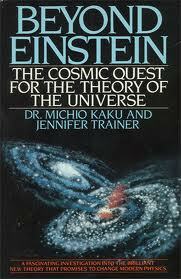 Paper Masters writes custom research papers on Beyond Einstein and look at a book by Michio Kaku and Jennifer Trainer about the idea of physics in higher dimensions.